The programme for the festival has been released today (17 May 2016). The programme has details of the live music on our two stages: the Main stage with Leeds Music Trust and the Cloth Cat Stage, as well as the dance, martial arts and clown acts in the Arena. 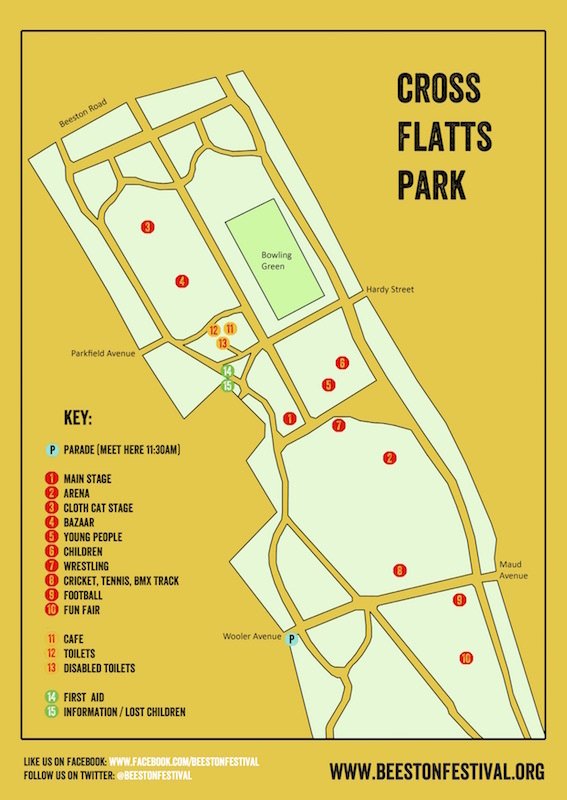 A handy map will help you navigate Cross Flatts Park so you don’t miss anything from the 100 stalls in the Bazaar to the children’s activities, sports and fun fair. Unity Homes & Enterprise has been announced as the main sponsor for this year’s Beeston Festival which takes place on Saturday 4 June in Cross Flatts Park. Preparations are well under way for the big day which will feature live music from The Ukrainians; food from around the world; dance in the arena; sports, inflatables, arts and crafts; a fun fair; and of course dozens of stalls in the bazaar. 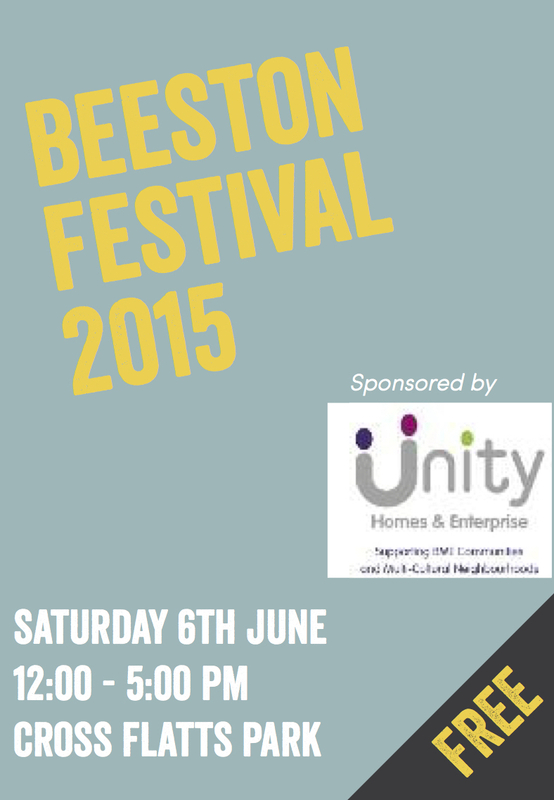 “Unity Homes and Enterprise has an historic association with Beeston Festival and we are proud to be lead sponsor once again. “The event has become a highlight in the Leeds summer calendar and, alongside local residents, attracts many people from outside the area to celebrate what is best about Beeston. “Unity owns a significant number of homes in the area with 18 new houses also under construction and others in the pipeline. Beeston Festival has also received funding from the Inner South Community Committee; Beeston & Holbeck councillors; City & Hunslet councillors; the BIG Lottery Fund; and Sport Relief Community Cash. This post first appeared on South Leeds Life. Our annual report and accounts were approved at our recent Annual General Meeting. Yorkshire Life Aquatic are teaming up with Beeston Festival to create a “Birds Eye” View display using people to create giant words and patterns in the park. We are looking for people to join in with us to make this happen at Beeston Festival on Saturday 6 June 2015 in Cross Flatts Park in Beeston. We are hoping that you can come along and bring your friends. We are Yorkshire Life Aquatic (a dry land synchronised swimming team based in Yorkshire) and friends and our mission is to create with festival goers a “birds-eye’ view display to celebrate and send a hopeful message for people using words in synchronisation. We want to spell out the words “Close the Gap’ as a message of hope for our communities. Close the gap – for the common good of every person. For this to have the most effect we need people as many as possible, the activity is open to all ages and abilities. We welcome everyone to join us. The highlights will be captured from above with a camera and mini helicopter device. We would like to evolve a “birds-eye message” of hope and joy to celebrate communities everywhere at Beeston Festival. We will begin assembling people at 12 and the activity starts at 1pm. Come along and/or share this with your networks and/or invite along friends/ groups of people you work with. Feel free to get in touch via email zoe@yorkshirelifeaquatic.co.uk or telephone Zoe on 07739 456156. The programme for the 2015 festival has been published. Copies will be distributed via schools after half term and will be available on the day in the park.